Looking for the keyboard shortcuts to apply font and fill colors to a cell? Unfortunately, there aren't any built-in to Excel, but this article explains some workarounds and an easy way to customize your own. This article explains all the possible ways to apply font or fill (background or shading) colors using keyboard shortcuts, including a way to customize your own. I have done extensive research on this issue, and this article is a collection of all the solutions you will find on the web. So this should save you some time in your search for an answer. The shortcuts presented here are for Excel for Windows versions 2007, 2010, & 2013. Well, I'll give you the bad news first to get it out of the way… There is no keyboard shortcut in Excel that directly applies a font or fill color to a cell. Sorry I have to be the one to tell you that. But the good news is that there are a few workarounds that will get you close. And the better news is that I have developed a simple (free) solution that will allow you to easily customize your own keyboard shortcuts for font and fill colors. In the first part of this article I will explain all the built-in keyboard shortcuts that will help you apply font and fill colors. Since there is no direct way, I consider these to be workaround solutions (#1-#4 below). Even though these workarounds won't directly solve your problem, there are some great tricks to learn here to help save you time. The ultimate goal of using a keyboard shortcut is to save time. Especially for repetitive tasks when you need to quickly apply the same colors over and over again. None of the workaround methods really accomplish this, so I created an Excel add-in that will allow you to customize your own shortcuts. The add-in is explained in #5 below with a link to the download page. Step-by-step instructions and the pros & cons of each of these methods are provided below. Use the arrow keys on the keyboard to select the color you want. The arrow keys will move a small orange box around the selected color. Press the Enter key to apply the fill color to the selected cells. Alt+H+F+C is the shortcut for the Font Color menu and functions the exact same as the Fill Color menu. You can select a color from the menu using only the keyboard. Any color on the color palette can be applied relatively quickly. This method is SLOW. It's really a three step process, and even more time consuming if your color is at the bottom right side of the color palette. There is a lot more room for error because you are required to press the arrow keys multiple times. Font colors are even harder to apply because the shortcut (Alt+H+F+C) contains an additional letter. 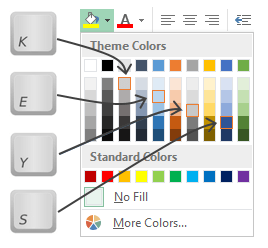 The Fill Color and Font Color menus can be added to the Quick Access Toolbar (QAT). This will help make the keyboard shortcut to access them shorter. 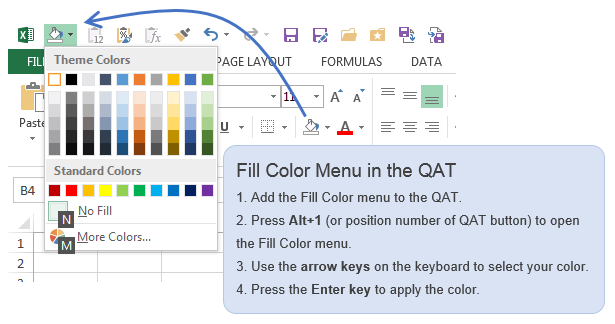 Instead of pressing Alt+H+H, you could put the Fill Color menu in position #1 of the QAT and use the shortcut Alt+1 to open the Fill Color menu. See my articles on how to setup the Quick Access Toolbar and how to use the QAT's keyboard shortcuts for instructions on this. Once the menu is open you still have to use the arrow keys to select your color. It's basically the same three step process as above. This is faster than the Alt+H+H(FC) methods because you can eliminate at least one key stroke. If you are using the Font or Fill Color palettes frequently it might be nice to have them on the QAT. This way you can access the menus with the mouse without having to navigate to the Home tab on the ribbon. It's still slow and requires you to use the arrow keys to select your color. The F4 key is a great keyboard shortcut to know and can save you time. The F4 key will repeat the last action you've taken in Excel. For example, let's say you just used the Fill Color menu to change a cell to have a blue background. When you select another cell and press the F4 key, the cell's fill color will be changed to blue. The F4 key just repeats the last action you took. This applies to many different types of actions, not just font and fill colors. You can use F4 to add/delete rows/columns, change number formats, alignment, page setup, etc. The F4 key can be a real time saver any time you are doing a repetitive task. 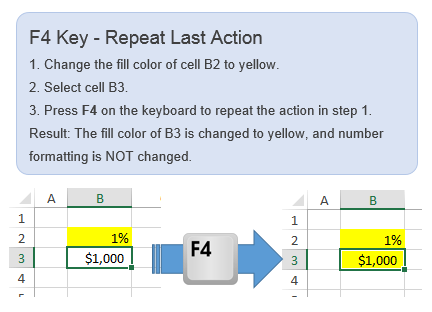 Checkout my free eBook, “Excel Formula Tricks” for a few additional tips on using the F4 Key. The F4 key can be a one-step solution to applying font and fill colors. It has many other uses and is great to know. It requires you to use another method for the first time a font or fill color is applied, and only allows you to repeat that process. Can only be used to repeat the last action. If you take a different action between needing the color shortcut then this will not work. Dominykas left a comment below about the Alt+Enter shortcut. Alt+Enter works in the same basic way as F4. Thanks for sharing Dominykas! The copy and paste formatting feature can be used if you have already applied the font/fill color to another cell. Similar to the F4 method mentioned above, you can quickly copy the colored cell and apply the formatting only to other cells. 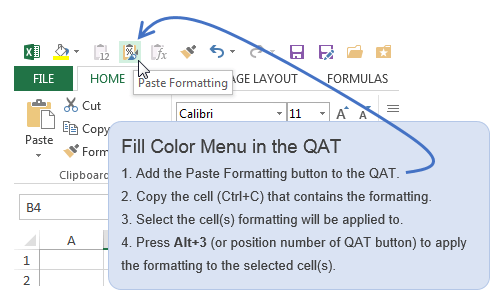 A keyboard shortcut for Paste Formatting can be created by adding the button to the Quick Access Toolbar (QAT). This makes it very fast to copy the cell that contains the color and then only paste the formatting of that cell. The values or formulas in the copied cell will NOT be pasted. Only the formatting is pasted. Again, checkout my articles on how to setup the Quick Access Toolbar and how to use the QAT's keyboard shortcuts for instructions on this. Probably the quickest way to copy formatting that is already applied to another cell. Better alternative to the Format Painter because you can use the arrow keys to move more than one cell from the copied cell before pasting the formatting. Not a direct method for applying a font/fill color. A cell must already contain the formatting you want to copy. Does NOT work if the copied cell and destination cell have different number formatting. The Paste Formats feature pastes all the formatting options that are applied to a cell. For example, if the cell you copy contains a number formatted as a percentage (%) and the destination cell you want to color contains a number formatted as currency ($), then paste formats will change the formatting of the destination cell to percentage. This is not what you want. The four solutions listed above are the best workarounds that I've found, and hopefully they will help you learn some new Excel skills if nothing else. But they do not directly solve the problem, which is to have a fast way to apply a font or fill colors with one single keyboard shortcut. So I developed this add-in that allows you to create custom keyboard shortcuts for font and fill colors. It basically allows you to choose your own shortcut key that will apply a specific font or fill color to the selected cell(s). The shortcut key is a combination of Ctrl+Shift+[any key on the keyboard]. You can change the shortcut key to any character on the keyboard. The screenshot above shows the setup menu for the shortcut keys. You can see that I have setup the keyboard shortcut Ctrl+Shift+A for the font color of red. When I press Ctrl+Shift+A on the keyboard the font color of the selected cells will change to red. It's a one-step process that is really fast! The shortcuts are saved so you only need to set it up once, and they can be changed at any time. You can also choose if you want the font or fill color to be changed in the Format Type drop-down menu. The “Font+Fill” option allows you to change both the font and fill color of the cell with one keyboard shortcut! In the example above, Ctrl+Shift+D will change the font and fill color of the cell to light green fill with dark green font. 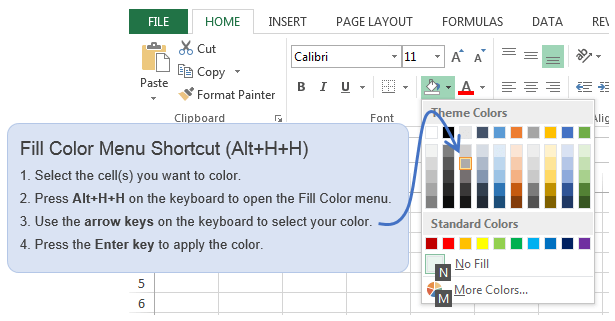 Create custom keyboard shortcuts to apply font or fill colors to selected cells in one step. The add-in is very easy to use, and there is a free version available! This is the fastest way to apply font and fill colors to a cell. Undo your changes if you accidentally press the wrong shortcut key. Does NOT change the number formatting like the paste formatting solution. Requires the use of an add-in. The add-in is easy to install and setup, but it is not built into Excel. Limited to one undo, but the full version of the add-in resolves this issue. Limited to three keyboard shortcuts on the free version. The full version gives you 10 shortcuts plus a lot of other features including number formats. Please visit the Formatting Shorctuts Add-in page to learn more and download the add-in. Installation instructions and a user guide are also included, the add-in is very easy to use. Unfortunately there are no direct keyboard shortcuts for font & fill colors. 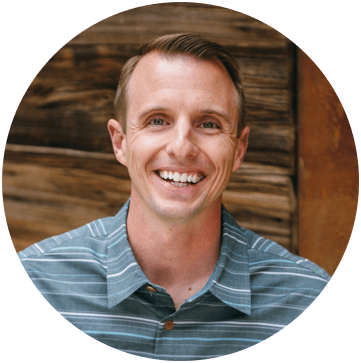 Hopefully you learned some new tricks with the workaround solutions (#1-#4) that you can apply to other areas of your work. If nothing else, at least it will save you time from doing the web searches and research I did before building the custom add-in. Did I miss anything? Do you know of any other ways to apply font & fill colors? Please leave a comment below with any suggestions or questions. I would love to hear from you. Does this work for Word also please? I use 5 colours regularly and have managed to set black and red only. If your add-in works with Word it would make three more colours available. Sound great if I can use it.